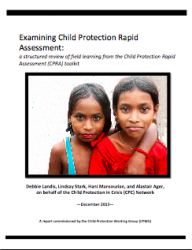 From May to September 2013, the Child Protection in Crisis (CPC) Network conducted a structured analysis of field learning regarding the Child Protection Rapid Assessment (CPRA) toolkit, in order to identify key findings, lessons learned, and recommendations for its future use and implementation. The review covered use of the CPRA toolkit in 15 countries: Burkina Faso, Indonesia, Iraq, Jordan, Lebanon, Mali, Myanmar, Nigeria, Pakistan, Philippines, Somalia, Syria, Thailand, Tunisia, and Yemen. This study found that the CPRA toolkit was a valuable addition to the field and a means of increasing the methodological rigor with which child protection assessments are carried out. However, findings suggest the tool is often dependent on technical assistance, it is used outside of the recommended time frame, and that additional approaches were often used in conjunction with the tool. The research brief and full report are below.